Have you recorded a trail which track has a straight line? Did the App stop recording while you were doing a trail? Most Android devices have optional energy-saving systems which automatically stop Apps that are running in the background when they need resources. Some mobile manufacturers activate this energy-saving system by default. 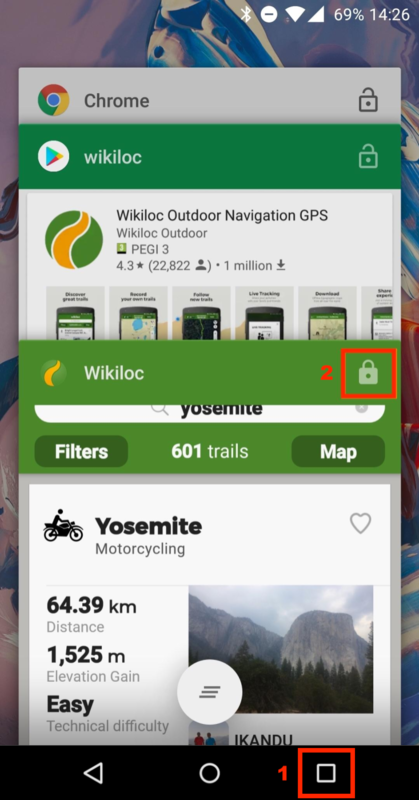 In order to avoid bad experiences while recording a trail with your Wikiloc App, we have added a new App mode called " uninterrupted recording" which will try to keep your app up and running when you're recording a trail. The App will suggest you activate this mode when it detects that the device stopped recording. If you accept, it will activate every time you follow or record a trail. This method can spend a bit more battery, activate it only in case of need (if manual methods did not work). You smartphone's settings -> Applications and notifications -> Configuration -> Special access of applications -> Battery optimisation. In the upper header of the screen, click on "Do not optimize the battery" and change it to "All applications"
Click on Wikiloc and select "Do not optimize the battery" and apply the changes by checking "Done". It is highly recommended that you also perform steps 2 and 3 with the system applications called Combined Location and Location Services. Huawei smartphones are provided with some protection to ensure that the battery will last a long time. This protection must be disabled to let the apps continue running while in background mode. Open the Huawei system App " phone manager", select the "battery" pictogram. Disable the "Energy saving mode" and the "Ultra saving energy mode" options. - Go to your device's "settings", "Apps & notifications", "Apps"
- Disable the "Ask about intensive consumption"
- Within the "start" section, disable the "automatic administration" and activate all elements on the "manual administration" section . Click on the el "lock" symbol on the upper right corner of the app tab to avoid it being forcibly closed by the energy-saving system, (red number 2 in the screenshot). Xiaomi smartphones are provided with some battery savor protection. In this page, you should select the Off option instead of the default Normal option.